Despite the increasing amount of tab and chords for ukulele on the internet, we still have to rely on guitar chords for most songs. If you’ve done this a lot, you’ll have come across – and possibly confused by – chords that look like this: D/F#. These are known as ‘slash chords’. It’s often not the case on the ukulele that the lowest note is the root. As there are only four strings, we have to take the notes wherever we can find them. So, what do you do on the uke when you come across slash chords? That depends on what the bass note is. If the bass note is part of the chord, you can ignore it and play the usual chord shape. If it isn’t part of the chord, you’ll have to add it in somewhere. The first slash chord in this sequence is C/B. 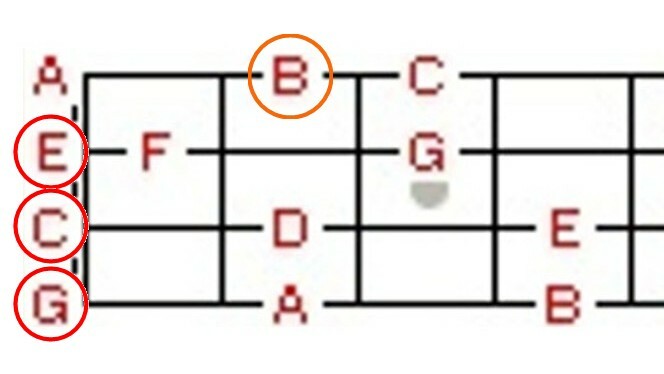 B is not part of the C chord so you have to add it in (A string second fret). The same is true with C/A – there is no A in a C chord so add the open A string. If you’re not sure how chords are made up and what notes they contain, check out How To Play Ukulele Chord Progressions – it’ll give you a real understanding of how chords work and what you can do with them. Sign up for the Uke Hunt newsletter! Receive the latest Uke Hunt posts in your inbox.